Controlled demolition can be carried out with the use of our robotic remote control demolition machines. 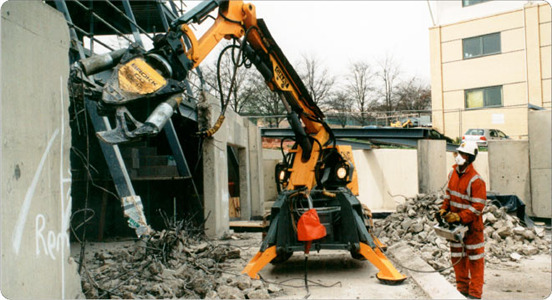 Brokk machines are purpose built for demolition with the use of its hammer or crunching attachments. It can also be used as a digger with the use of its digging bucket attachments. One of the major advantages of these machines are that the can be used in live buildings inside and outside such as airport terminals, hospitals, shopping centres, hotels, etc. They are equipped to work in high temperature environments such as cement kilns also. Demolition, renovation or excavation works can be completed more efficiently and safely ensuring schedules are achieved by using one of our brokk robotic machines. The attachments which can be used for these machines allow for every possible work environment scenario. With the impressive weight/power ratio these machines have the power to demolish any concrete structure eliminating extra costs such as propping or shoring. These are purpose built machines which in turn makes them way ahead of any small mini digger or track machine equivalent in terms of safety, costs, accessibility and productivity for any project.